Local heritage is about who we are, and recording is preserving memories that will be shared within the community and beyond, even internationally. This was the message at the launch of the new Co Galway heritage website, in which six local groups each have their own section. Other area groups will have the chance to have their site in the future. The launch took place in Moylough Community Centre, in the home village of the County Heritage Officer, Marie Mannion. Marie was at pains to point out that the venue was chosen by lottery, but she was delighted to be so close to home. 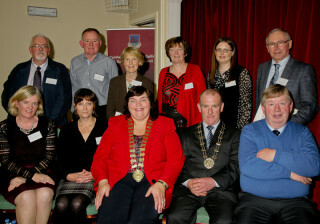 County Cathaoirleach Mary Hoarde, who jointly launched the site along with Tony Candon, manager/keeper of the National Museum of Country Life in Castlebar, said the new web presence provide a valuable insight into the people and places of the county. She praised the dedication and hard work of the six areas, Moylough, Milltown , Killererin, Skehana, Abbey (Loughrea) and Oughterard. It is now possible for people to have at their fingertips the knowledge of where they came from, said Cllr Michael Connolly, who commented that the new site would be a great service for the Irish Diaspora throughout the world. Speakers from the areas represented on the website paid tribute to those who had given expert support, including Lorna Elms of the Museum of Country Life, David Collins, Oughterard and Gerry Costello of Skehana, as well as Marie Mannion, whose tireless work was praised by all. Bernadette Forde of Killererin Heritage society outlined the work they had done since 2008 and said they looked forward to the publication to the parish history after 17 years of research and writing. Abby, Loughrea is often confused in northern part of Co Galway with Abbeyknockmoy, said Francis Holihan, but it is proud to be the only site of the only Carthusian foundation in Ireland. 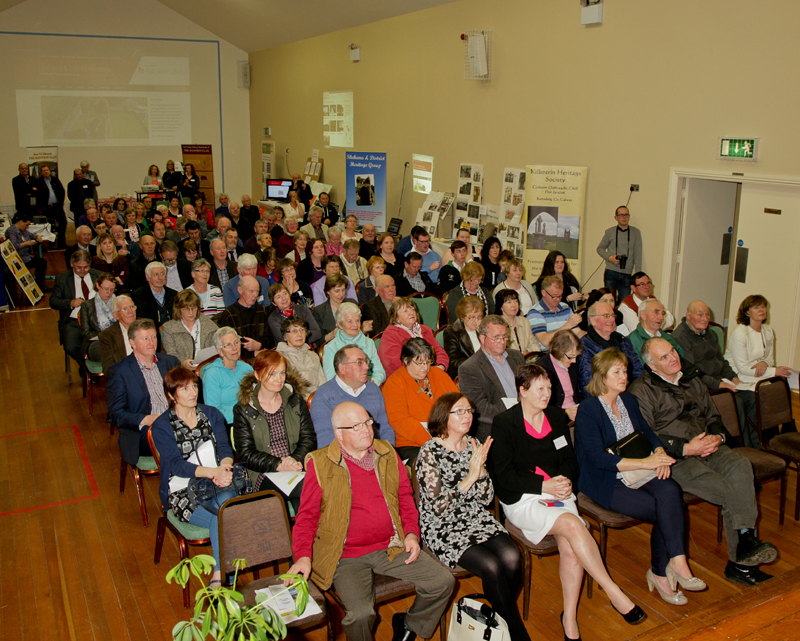 Pauline Connolly spoke of the work done in Milltown over the years including the development of the heritage park and herd’s cottage, and PJ Carthy of Moylough Heritage Group said they worked closely with the Skehana society. He commented that a website is always alive and growing, whereas a book is stuck in time. The numbers attending the talks given in Skehana have grown steadily, said Gerry Costello, and their latest project is a burial grounds survey. Marie Mannion praised the long hours and hard work of the groups. They were helping to develop a country heritage brand. The county is a jigsaw, she added, and we owe it to ourselves to document its history. Marie concluded that she was very happy with the ethos of generosity and sharing between groups that embodied the spirit of meitheal.